FILE - Israeli Prime Minister Benjamin Netanyahu chairs the weekly cabinet meeting in Jerusalem, March 3, 2019. Israeli Prime Minister Benjamin Netanyahu said on Friday he would sue two of his main political rivals for libel, claiming that they labelled him a traitor over a graft scandal involving a German submarine deal. In a video published on his Facebook page, Netanyahu said he instructed his attorneys to take legal action against former armed forces chief Benny Gantz and ex-defense minister Moshe "Bogie" Yaalon. Both are from the centrist Blue and White party which is seeking to unseat the veteran prime minister in an April 9 election. Opinion polls put Netanyahu’s right-wing Likud and Gantz’s new party neck-and-neck. 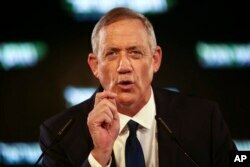 FILE - Retired Israeli military chief Benny Gantz speaks at the official launch of his election campaign for the April 2019 polls, in Tel Aviv, Jan. 29, 2019. Netanyahu's lawyer and other suspects have been the focus of a long-running police investigation into the sale of German submarines to Israel, amid concerns about a conflict of interest. Israel's Defense Minister Moshe Yaalon, speaks during a press conference at the Defense Ministry in Tel Aviv, Israel, May 20, 2016. Netanyahu was questioned by police in the investigation but investigators said last year that the prime minister was not a suspect. He issued the video in apparent response to comments Yaalon made on Israel Radio about the submarines case two days ago. 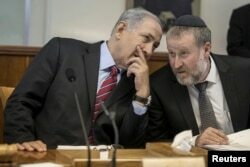 Gantz, who has promised to pursue clean government, has sought to undermine Netanyahu by focusing public attention on the state's decision not to deem the prime minister a suspect in the submarine case. In a video statement in response, Lapid said Netanyahu's video was full of lies and that neither he nor his colleagues had called the prime minister a traitor. He said he was willing to forgo his parliamentary immunity to prove it, adding: "Sue me." Officials in the Blue and White party said Gantz was unavailable for comment on Friday because he was on his way to the United States. 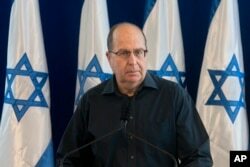 Asked about Yaalon's response, the party referred to Lapid's video statement. For his part, Netanyahu has put Iran's alleged hacking of Gantz's cellphone at the forefront of his election campaign, repeating in his video on Friday — without presenting any evidence — an allegation that it contained information Tehran could use to blackmail the former general. Iran has denied targeting Gantz. Gantz has said he had been informed by Israel's domestic security service of a breach but there was no sensitive information on the device. Israel's Prime Minister Benjamin Netanyahu, left, speaks with Cabinet Secretary Avichai Mandelblit during the weekly cabinet meeting in Jerusalem May 4, 2014. Last month Israeli Attorney-General Avichai Mandelblit said he intends to indict Netanyahu in three cases on charges of bribery, fraud and breach of trust, pending the outcome of a pre-trial hearing that will take place after the election. The prime minister's broadside against his strongest election opponents came a day after U.S. President Donald Trump announced his support for Israel's claim of sovereignty over the Golan Heights, in what was widely seen in Israel as a boost for Netanyahu. The prime minister will fly to Washington next week to meet Trump at the White House and address the pro-Israeli lobbying group, the American Israel Public Affairs Committee, or AIPAC. Gantz is also due to address AIPAC.